Looking for a fresh start, Peyton Clark becomes the proud owner of a piece of New Orleans history: an Antebellum-era two-story house in the Garden District. It's going to take time and a fat wallet to restore the fixer-upper to its former glory, but after her recent divorce, Peyton could use the distraction. It's not long before Peyton discovers she's moved into the haunted home of a flirtatious paranormal prankster. She's receiving kisses from unseen lips and caresses from a ghostly hand, and soon she begins to have vivid dreams, bringing her face-to-face with the incomparably handsome ghost of Drake Montague. Having read and loved several of H.P. Mallory’s books, this one is right up there with the rest. 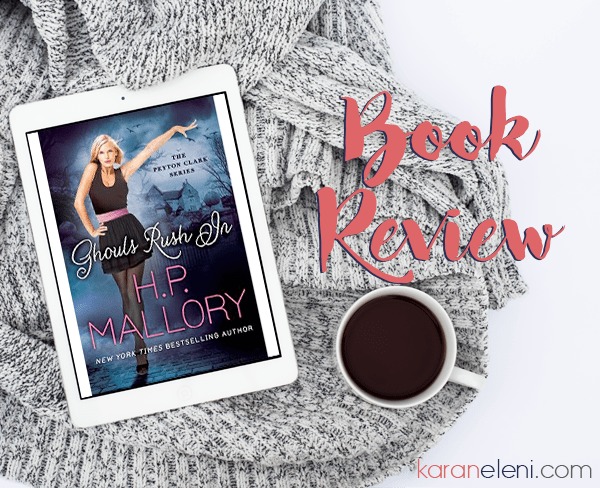 While H.P.’s previous three series feature paranormal characters, the main characters in Ghouls Rush In are mortal giving a different take on a paranormal romance. Peyton and Ryan (one of my new book boyfriends) are extremely likable characters and I cannot wait to see how their relationship blossoms in book two! I had already preordered but was blessed to have been approved for an ARC as well. Thank you H.P. and Montlake!! Book two has been preordered! H. P. Mallory is a New York Times and USA Today bestselling author of the Jolie Wilkins series as well as the Dulcie O’Neil series. She began her writing career as a self-published author and after reaching a tremendous amount of success, decided to become a traditionally published author and hasn’t looked back since. H. P. Mallory lives in Southern California with her husband and son, where she is at work on her next book.